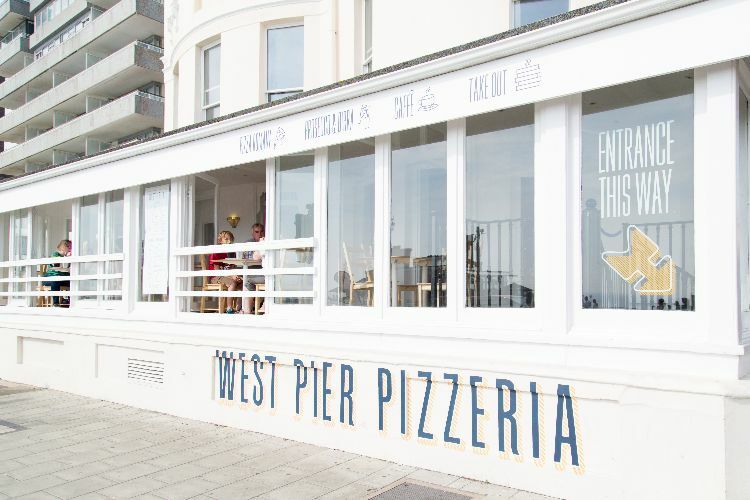 Just a stone’s throw from Brighton seafront and the i360, West Pier Pizzeria sits proudly in its new desirable location, having opened its doors at the end of August this year. The restaurant offers a light and minimalist environment with wooden chairs and white tables. As we enter the restaurant, my friend Sian and I notice the ‘dog-friendly’ sign. This fills Sian with sorrow at leaving her miniature sausage dog Errol at home, as he would have definitely enjoyed some of the meat on offer for any canine pals! Luca, the friendly and welcoming manager, explains there is a dog friendly section which allows all diners to enjoy their experience at West Pier Pizzeria. As we peruse the drinks menu, the Italian Sparkling White Wine is recommended to us. Luca informs us that this is served on tap (bonus!). We also try a glass of Verdicchio, which is crisp and fresh and comes with a light sparkle. The menu offers a choice of two to three wines for each colour as well as bottled beers and ciders; I like it when a menu is not too over complicated. West Pier Pizzeria also has Peroni on tap and cans of the local Brighton Bier (which, if I liked beer, I’m sure would be very appealing). I ask Luca if there are any dishes he recommends us trying. As I am a terrible decision maker, his response is ideal. He will bring us a selection of dishes from the menu for us to try. Wonderful. I am pleased to see they offer gluten free dough and pasta, as well as vegan options. Children’s portions are also offered at a 50% discount. 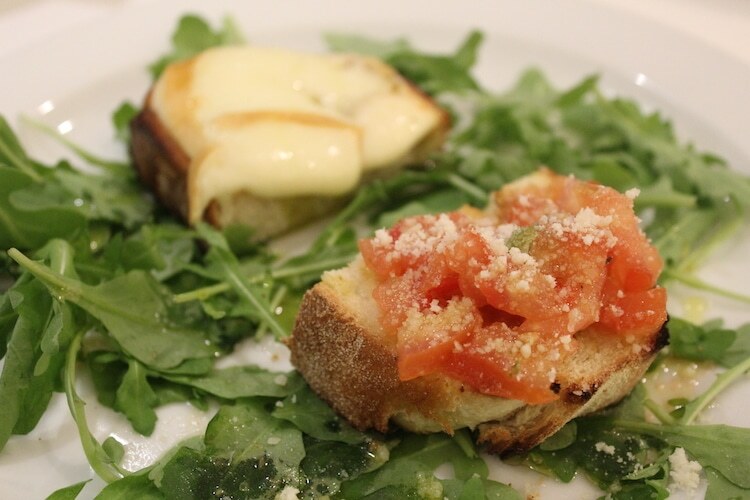 We start with a taste of the Bruschetta and the Crostone di Scamorza*. The Bruschetta has a base of homemade toasted bread topped with marinated tomatoes. The bread is baked in-house with loaves weighing up to 2.5kilos! The fresh tomatoes are complimented perfectly by a delicious layer of garlic butter. The Crostone di Scamorza is crusty bread topped with smokey cheese and is melted just enough; it contrasts the bed of rocket beneath it. Luca also brings the Bresaola for us to try. 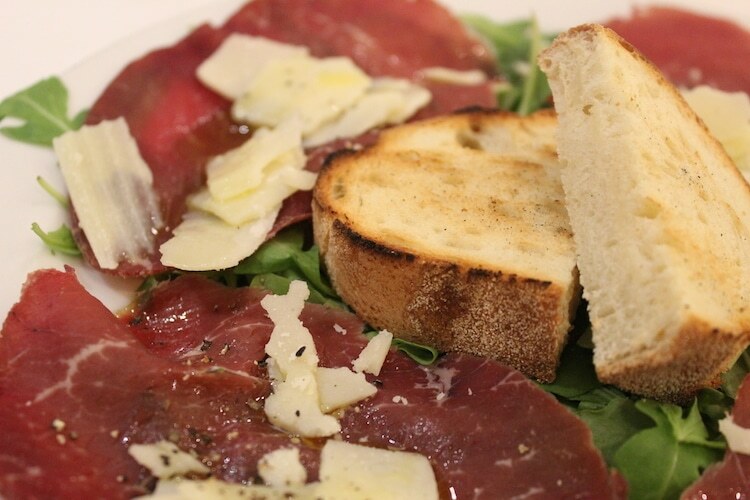 These thin, cured beef slices topped with cracked black pepper deliver so much flavour and are just the right amount for a light starter. The generous shavings of parmesan cheese offer a saltiness and texture to the melt in the mouth beef slices. Luca brings out a taste of the Minestrone soup to try; the abundance of soft vegetables in a tomatoey broth is perfect for a chilly day. 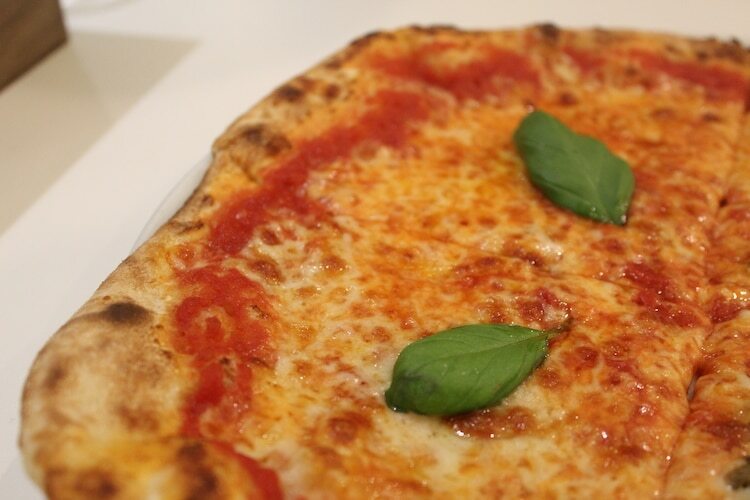 For mains, Luca recommends we try the Margherita pizza. He says there is nowhere to hide with this classic and if a restaurant gets this right, you know they make a good pizza. Sian’s favourite is the Napoletana so Luca very kindly offers us half and half. Again, no decisions need to be made so this is ideal for me. 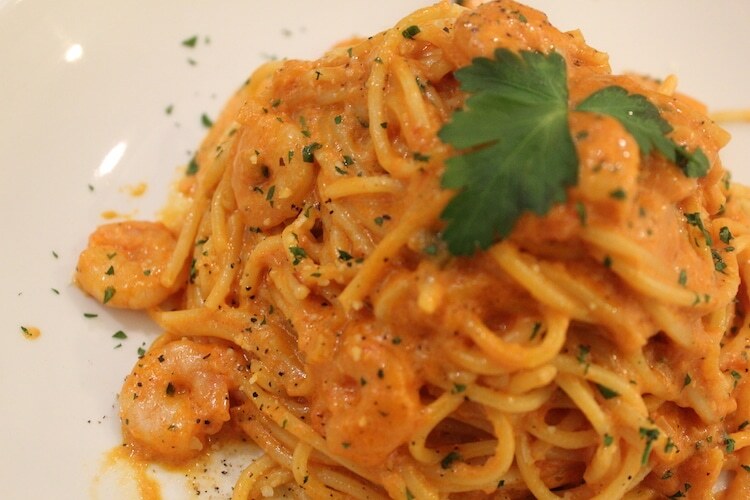 In keeping with the Italian tradition, we also choose the Gamberetti, a pasta dish in a rich tomato sauce with prawns. I like that you can choose between spaghetti and penne pasta; Luca recommends spaghetti. 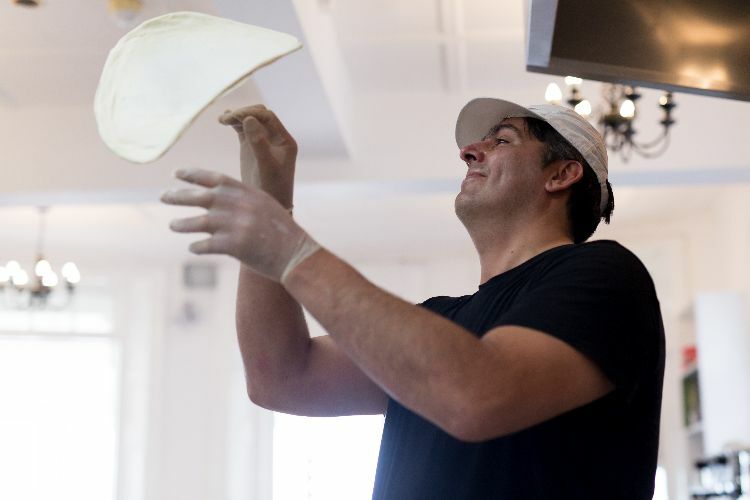 The Romana pizzas are a thin, crispy base made freshly by Francesco, who picked up his pizza dough baking skills from working in the Neapolitan region in Italy as a teenager. The base is light yet slightly chewy and has just the right amount of crust. The tomato base is generously smothered on top which is rich and flavoursome. Luca is right, there is nowhere to hide with a Margherita and I am pleased that he recommended it. I usually choose a pizza with far too many toppings, so for me, it is great to enjoy the classic ingredients, complemented by a sprig of basil on top. 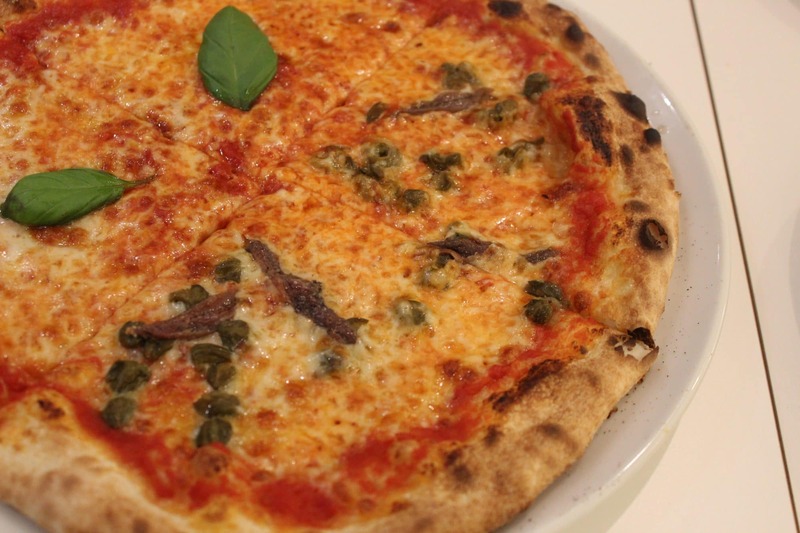 On the Napoletana, the saltiness of the anchovies and juicy capers offer a welcome contrast. I cannot resist a dip in the chilli oil which is sat on the table. The tomato sauce of the Gamberetti is deliciously creamy and is incredibly moreish. The sauce is accompanied by a generous helping of fresh prawns sat amongst the spaghetti. 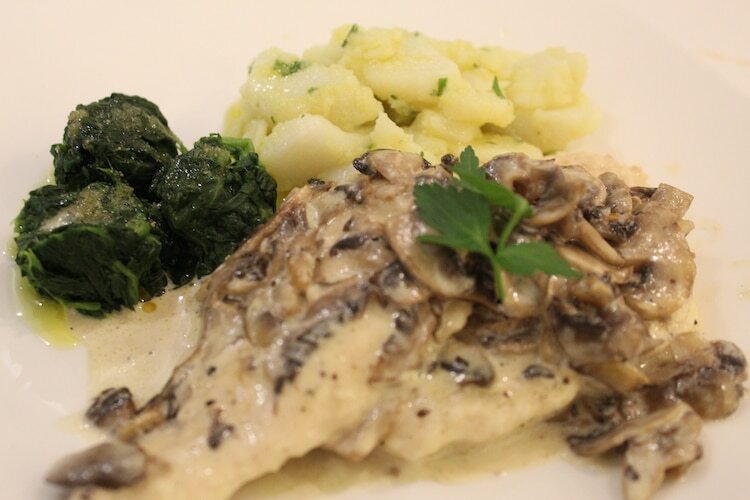 Luca is also keen for us to try the chicken escalope special, served with a mushroom sauce, spinach and a potato salad. The chicken is moist and the mushroom sauce is rich and smooth. 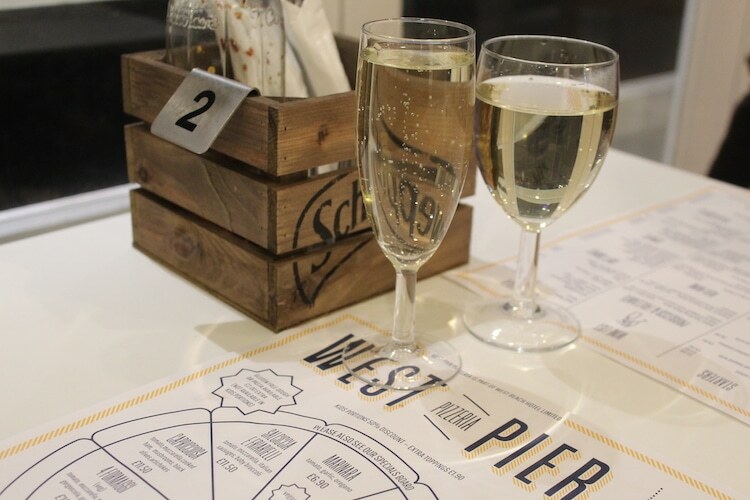 West Pier Pizzeria has it all. A fantastic, central location, extremely reasonable prices, friendly, welcoming staff and delicious food. It has a ‘no fuss’ attitude to good quality food made with passion, with a menu that serves the classics well. 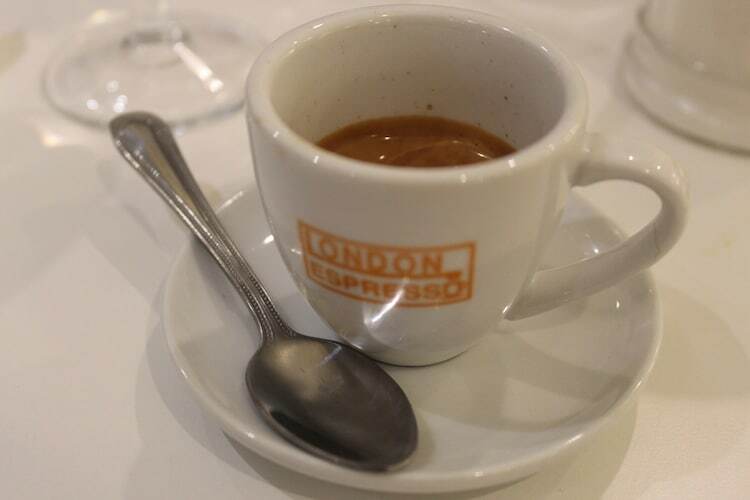 Not to mention the best espresso in Brighton. *The individual portions of these starters are larger.